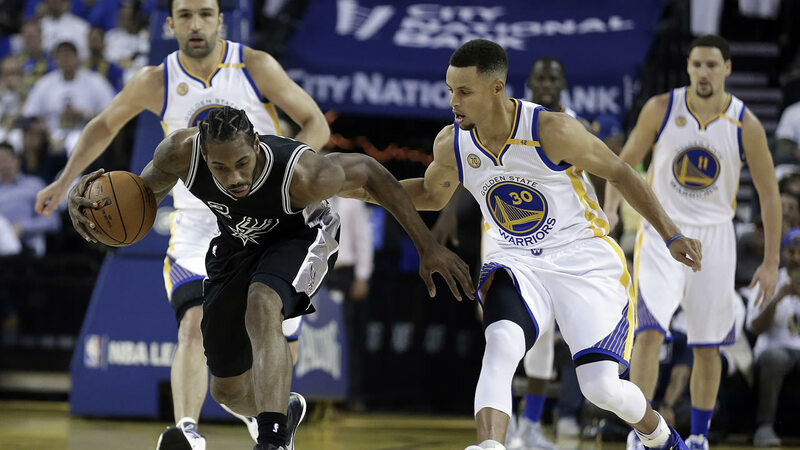 OAKLAND, Calif. -- Kawhi Leonard scored a career-high 35 points and the San Antonio Spurs emphatically spoiled Kevin Durant's long-awaited Warriors debut Tuesday with a 129-100 rout that sent Golden State fans for the exits early on opening night. Durant had 27 points and 10 rebounds, but little looked in sync for MVP Stephen Curry and the reigning Western Conference champions in a forgettable first game - and quite a different one after the Warriors dominated at home and came out of the blocks last season with a record 24-0 start. Leonard scored 31 points by the end of the third, LaMarcus Aldridge added 26 points and 14 rebounds and Gregg Popovich thoroughly outdid a couple of his close friends on the opposite bench in reigning NBA Coach of the Year Steve Kerr and top assistant Mike Brown. Yes, San Antonio sent quite a message to the West. Curry, last season's first unanimous MVP, scored 26 points but was just 3 for 10 from 3-point range. Draymond Green had 18 points, 12 rebounds and six assists, while Klay Thompson was limited to 11 points on 5-of-13 shooting. The star-studded Warriors were sloppy, committing 16 turnovers. They are clearly still finding themselves just as Kerr expected - though maybe not quite like this while playing at home for the sellout crowd at Oracle Arena, where most fans were long gone by the final buzzer. San Antonio exhibited smooth, crisp ball movement and looked polished in a game that had a playoff feel on Day 1. Two-time Defensive Player of the Year Leonard shot 10 for 21 and made all 15 of his free throws. Jonathon Simmons came off the bench to score 20 points, including a 3 to beat the halftime buzzer for a 64-46 advantage. His status had been in doubt for the opener because of a calf injury. Green dunked off a pass from Curry early in the third to get Golden State within 10, only to pound his chest and yell before being hit with a technical. The Warriors had flurries of greatness trying to get back in it. San Antonio answered each time - like when Golden State pulled within 50-42 in the second quarter before the Spurs closed the half on a 14-4 run. The Warriors trailed by 18 in the second quarter, were outrebounded 30-17 in the first half and shot 4 for 19 from 3-point range in the first two quarters. Durant made a 14-footer 65 seconds into the game and hit his first four shots. After one impressive sequence, he raised his right hand in the air then smacked himself on the backside after making a 3-pointer just 25 seconds after his fadeaway jumper midway through the first. But he didn't have much help early. San Antonio led 31-20 after the first, when the Warriors shot 7 for 20 with four baskets by Durant. Golden State's other players were 3 for 15, and the Warriors got outrebounded 17-9. Durant's former Oklahoma City Thunder defeated the Spurs in the Western Conference semifinals. These rivals faced off in the season opener for the fourth time and first since 2002. Click here for more stories about the Golden State Warriors!